Valentine's Day Outfits and More! Hello 2018! And Hello my faithful readers and followers! This is the first blog post for 2018 and I am excited to start it off for the month of love and friendship, that is, February (Valentine's Day)! 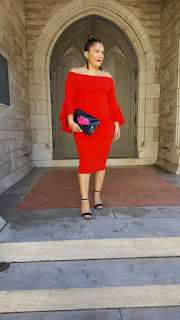 I want to start with three looks that are all from JcPenney and I want to share the details of how much I saved and what I scored on! JcPenney is one of my favorite stores to shop because I can use rewards points and coupons! And when they have an additional percentage off the clearance items, you know I am going to take advantage and score on favorite pieces I have been keeping my eye on for that sale or clearance mark-down!! !